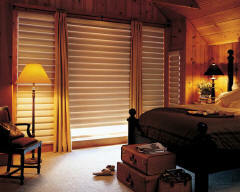 Hunter Douglas horizontal shades offer an array of design options and styles, ideal for windows in your home that are taller than they are wide. 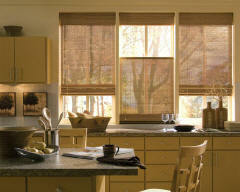 Provenance Woven Wood Shades add a warm, rich dimension to any room, whether they’re hanging flat in the fully lowered position or raised, creating even, overlapping folds. 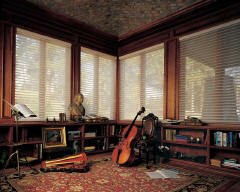 Featuring the Signature S-Vane™, Silhouette window shadings transform sunlight into remarkable beauty. 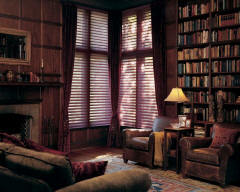 Available in a wide range of beautiful fabrics, including casual linen, woven and light dimming materials. With soft, horizontal fabric vanes attached to a single sheer backing, Pirouette window shadings control light in an entirely new way. Featuring fabric vanes suspended between two sheer fabric facings, Nantucket window shapings transfrom natural light entering a room into a warm glow while also blocking harmful UV rays.